I’ve been taking a break from the website these past few months to get back into video games. I’ve been buying a lot of import Japanese games I missed out on when I stopped playing games in college (couldn’t afford it). Unfortunately, I should have done this while I was living in Japan because buying import games can get expensive but really I was too busy at the time with stuff like you know… living in Japan! But you know what my pet peeve is? People bidding up used games I wanted to buy past the price it would cost new on amazon.co.jp! Look, don’t bid $40 for a used game you can buy new for 3,000 yen. Since the yen is finally down to reasonable levels, let’s buy some games direct in Japan! For example, instead of paying $39 for Final Fantasy Type-0 on play-asia or for $45 USED on ebay (duh), let’s buy it for about 30 bucks NEW on Amazon Japan using these (not so simple) steps. Create an account on tenso.com, a forwarding service that gives you a Japanese address you can ship items to. There are other potentially cheaper services but I found that this one was the cheapest for EMS, a really fast way to get your stuff with tracking (let me know if there’s a better service). There’s a link to the English version of the site on the upper-right. *Due to some new law in Japan or something, you may have to upload an image of identification with your name and address. No big deal, I just uploaded a picture of my driver’s license on the website. After you sign up, you should get an email with your new Japanese address. You’ll need that later obviously. You can also check it on their website. Search Wikipedia for the game so that we can get the Japanese title (right next to the English title in parentheses). 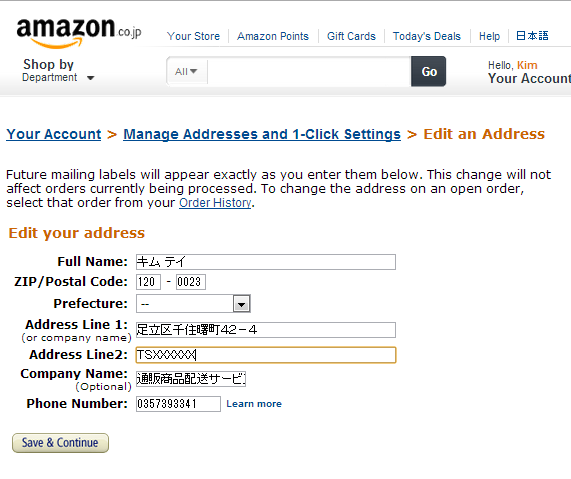 Go to amazon.co.jp and copy+paste the title into the search box （in this case ファイナルファンタジー 零式）. There’s a tiny link “In English” at the top right to get the English version of the site. None of the product information will be translated but it may help you for creating an account and checking out. Go through the usual checkout process. Amazon will take care of the currency conversion for you. The only trouble I had was fitting the massive forwarding address within the maximum length requirements. Here’s how I arranged it so that it all fit. You should get an email once the order arrives at tenso and you can go to their website to pay them to then forward it to you. I paid with my credit card via Paypal to avoid a foreign transaction fee. There’s a shipping calculator on the bottom of the page on tenso.com. If you put the weight of a PSP game (about 170 grams), you can see that it will cost about 1,690 yen to ship. So about $23 for the game and $18 for shipping means you pay $41 for a new game. Wait, isn’t that MORE than play-asia? Yes but usually, you want to save on shipping by buying in bulk. For example, I bought 3 PSP games and paid about $24 on shipping so only $8 for each. In retrospect, I should’ve bundled more games for even more savings. By buying in bulk, I can usually get it down to around $5 per item. Also, try to pick items that ship from amazon so that they can send all the items together. Tenso.com can consolidate multiple packages for you one time only (and you should for multiple packages) but they will charge a consolidation fee depending on how many packages need to be consolidated. Why don’t they localize more of these games? I wish they would as it often drives down the demand for people like me that actually want the Japanese version and not simply because it’s the only one available (perfect example is Mother 3). I got a Chinese copy of Jeanne D’Arc off ebay, which would have really pissed me off except the game itself is completely in Japanese. Only the cover and manual are in Chinese. Weird, I’m not sure how that really makes any sense but I guess Chinese people are flexible enough with English and Japanese to deal with it?? On the other hand, Americans complain like babies if they have to, god forbid, read any subtitles, which is why everything has to be dubbed often with disastrous results. If people say they prefer the Japanese voices, they get comments like, “OMG, why would you want to READ the dialogue? ?” and get called stupid stuff like “weeaboo”. Take Final Fantasy XIII for example. Which do you think cost more? Throw in some Chinese and English subtitles for the Asian release and call it a day? Or hire all new voice actors to redo all the voices, redo all the animation to synch up the lips, and do a crappy Xbox 360 port on two discs for the US release? This entry was posted in Learning & Resources, Media by taekk. Bookmark the permalink. I actually made a tenso account and was going to buy a Wii U from Amazon and have it shipped, but for just one item it didn’t make any sense. I dismissed it as unnecessary, but I hadn’t considered multiple items. Well, a heavy item like a console is definitely something to mull over. I generally don’t buy new consoles right away but if you really must have it, tenso is probably the cheapest option. Probably would cost about $50 just for shipping though if you bundle some games with it, it might be worth it. I’ll probably end up buying the 3ds even though I don’t like the region lock. If only 新女神転生IV was on playstation! Well, the nice thing is that you can buy and download games to the 3DS, so you won’t have to worry about shipping. Unfortunately, not all games are sold on the eShop, but a lot of the good ones are. Everything Nintendo makes is on the eShop. I imagine Shin Megami Tensei will also be on the eShop. I also recommend Bravely Default and Fire Emblem. That’s great, can’t wait to get one. If only PSN allowed using US credit cards. I did read some horror stories about transferring downloaded games from Wii to Wii U so I’ll probably end up getting mostly physical copies of stuff. I think it’s ridiculous that you can only have one copy on one system at a time. That’s pretty disappointing to me, too. Japanese companies in general are too restrictive when it comes to their IP, whether talking about games, anime, movies, etc. Do you guys happen to know any site where you can just download Japanese games instead of buying a physical media? Also, I think the Japanese Nintendo eShop takes US credit card but you’ll need a Japanese console since it’s all region-locked. I only have Sony stuff and while they are region free, you’ll need a Japanese credit card to buy Japanese games on PSN. I don’t know anything about Xbox live but Xbox is pretty much dead in Japan so there’s only a handful of exclusive and mostly shmups. Virtual copies of stuff such as games and ebooks haven’t really taken off in Japan so stuff is pretty limited. Middleman free sure is awesome. Thanks! I’m definitely going to try it out though the prices seem pretty high and selection limited compared to Amazon Japan. I was wondering how safe is this method? I been meaning to built my ps2 rpg collection and some of the more rare titles like .hack cost an arm and a leg to get the US release. if I could get an answer I will appreciate it. I’ve done it many times for new games. If you want order out of print games like .hack, they usually have a huge gap in price between new and used. I’ve bought games used in amazon.co.jp but I prefer ebay as amazon doesn’t provide pictures of the condition. The few times I have ordered it blind, they were all in good condition though. Games owned by Japanese people usually are. So, tenso is safe and reliable. As for buying the game itself, it depends on the seller.